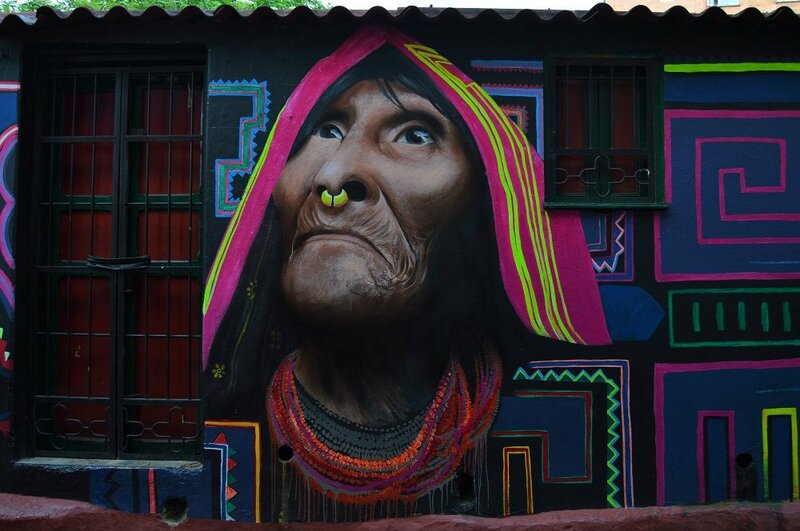 When you ask someone to tell you the first thing that comes to mind when they think of Colombia they will rarely reply “amazing street art”. Sadly, the correlations that initially occur to people tend to be negative connotations related to the country’s violent recent history, such as kidnappings, militants, and drug cartels. These negative connotations are incredibly unfortunate, as Colombia is a gorgeous country, filled with color, beauty, and friendly faces. 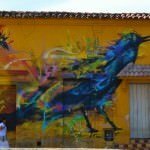 When we think back on our time in Colombia we recall endless verdant valleys, amazing people, incredible coffee, and the spectacular street art which was to be found in almost every town and city that we visited. 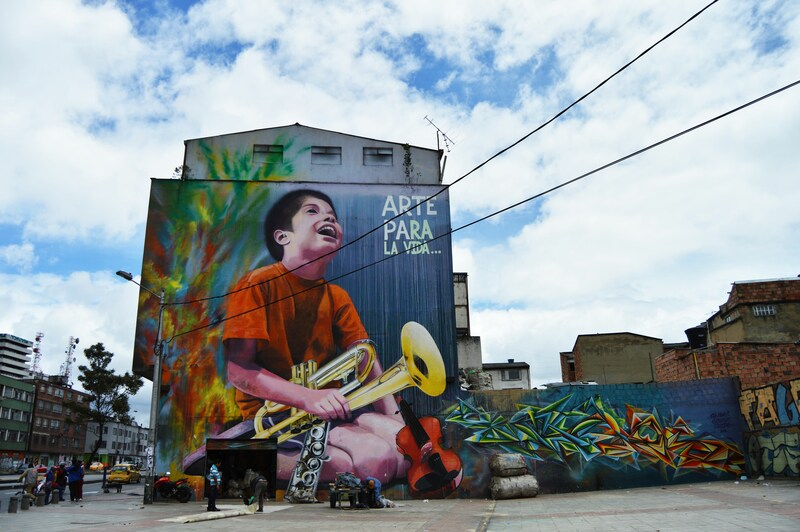 We have already covered the street art we found in Cartagena and in Medellin, but it was in Bogota, the capital city, that we discovered the most impressive and awe inspiring pieces of urban artistic expression. 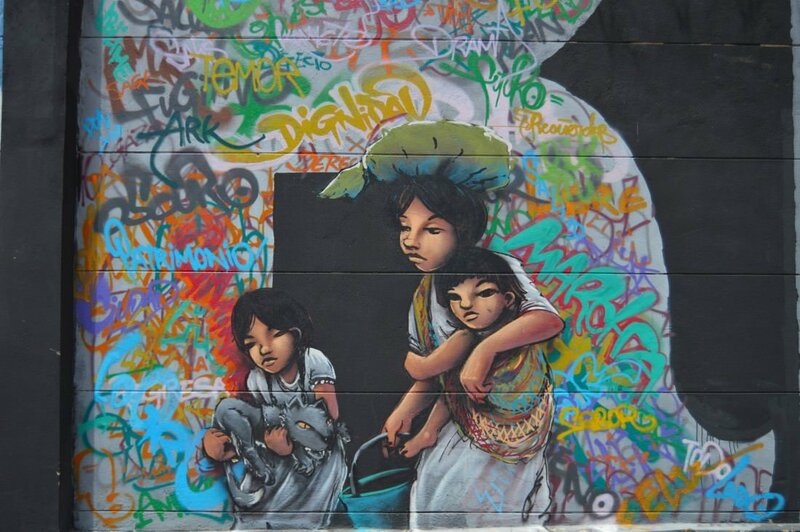 Part of a street long mural found on Calle 26 in Bogota. Street art, or graffiti, has deep roots in politically subversive messages, dating back to the Ancient Egypt, Greece, and the Roman Empire. 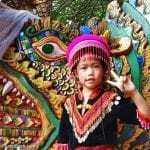 It’s long been used as a form of communication and expression among the oppressed, and those who might not have any other voice to reach the general population with. The messages, written in anonymity in the dark of night, were usually ones of resistance, ones that mocked those in power, and ones that gave revolutionaries hope that they were not alone. Political slogans scribbled on walls in the dark of night have been a mainstay in Colombia since the days before the rise of the FARC (Fuerzas Armadas Revolucionarias de Colombia or The Revolutionary Armed Forces of Colombia). 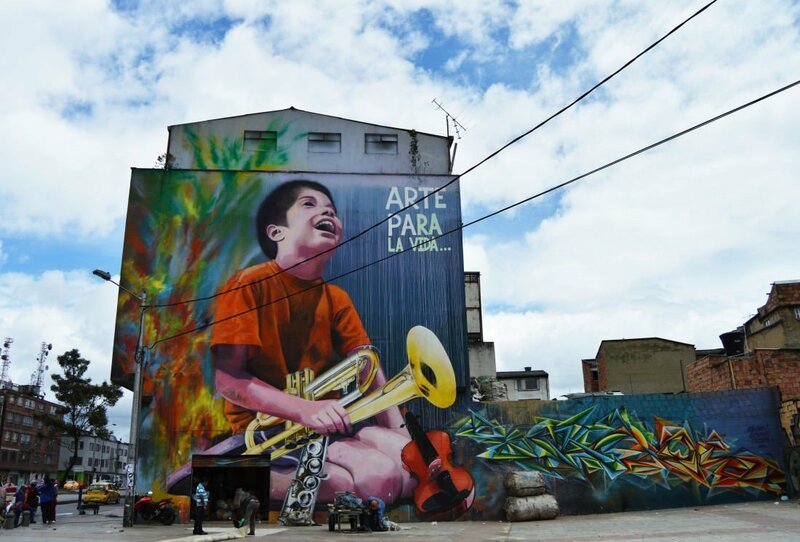 Street art in Colombia has traditionally been used to express the struggle of its people, to give them hope that one day the conflicts would end, and that they would be free to express themselves. 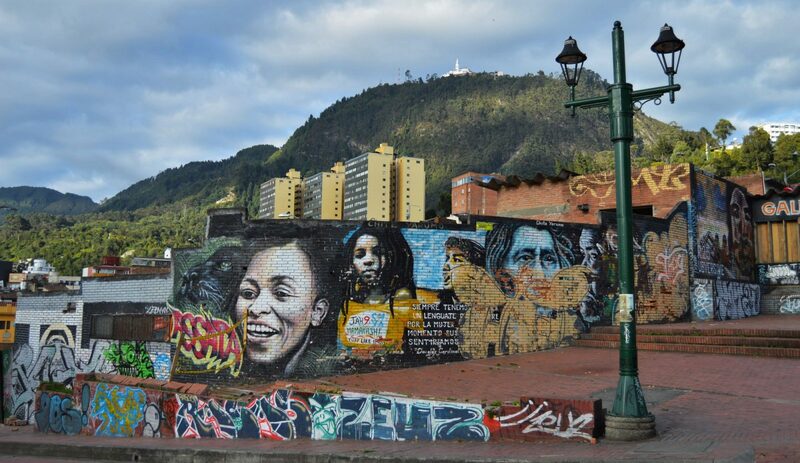 Urban art found in a square of La Candelaria, Bogota. 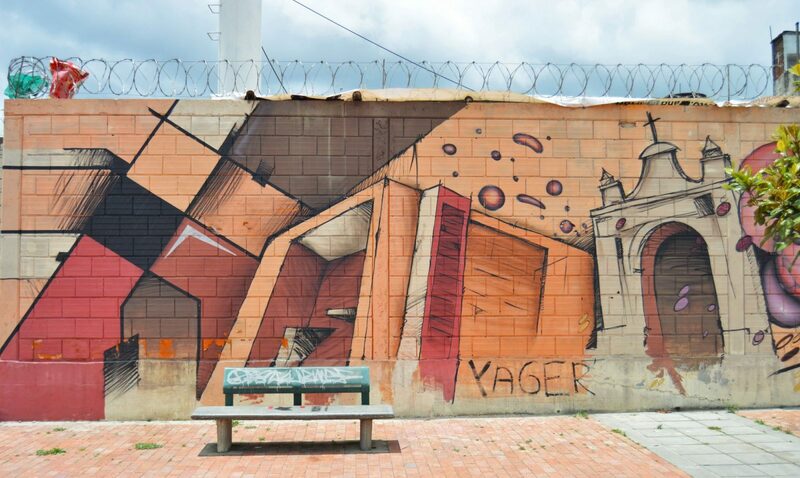 In recent years tensions in Colombia between warring factions have died down a bit, and street art is becoming more accepted as an legitimate art form. 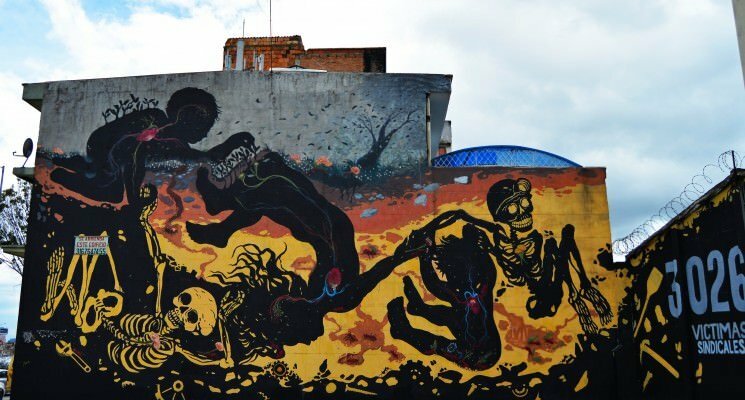 While Bogota has a fair share of art meant to reflect the country’s violent past, and its uncertain present, a majority of the images found painted onto what would otherwise be a grey concrete wall are simply expressions of creativity. 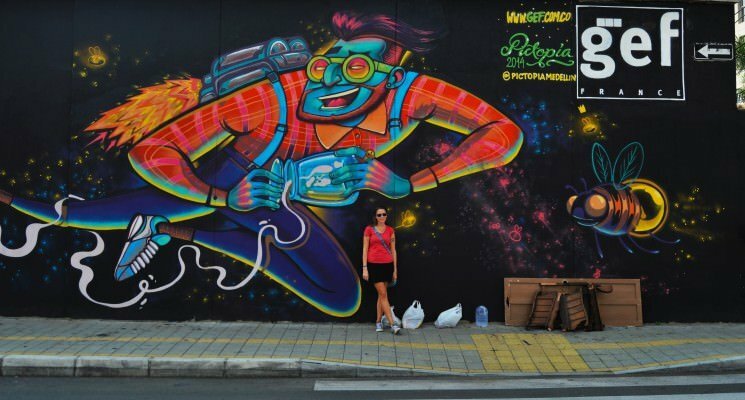 The city has recently relaxed its laws on graffiti and the result has been a boom in urban art that is seeing the city transformed into a riot of colorful imagery. There is something incredible when a drab concrete wall on a high rise in a loud noisy city is suddenly turned into a colorful canvas of artistic expression. There is a beauty to it that underlines the persistence of the human spirit, and proclaims loudly “We will take what is ugly, and make it beautiful”. 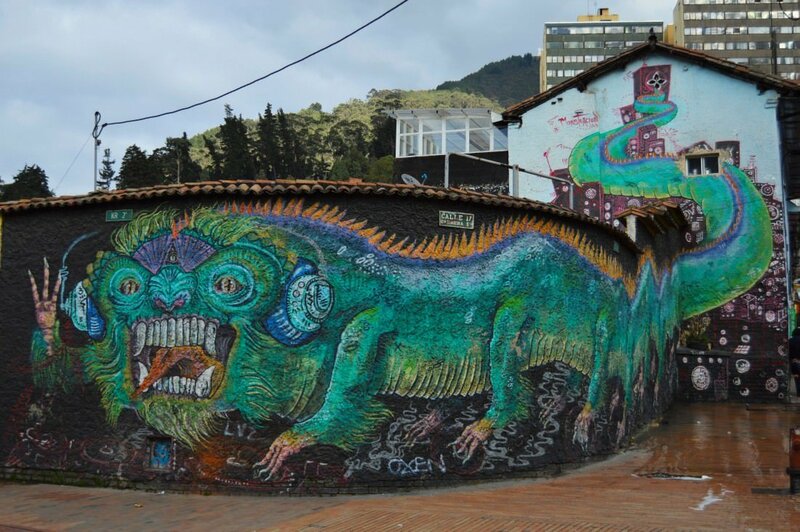 Awesome dragon mural on the outskirts of La Candelaria, Bogota. These photos are amazing! I’ve heard that the street art there is awesome. It’s true that the negative stigma remains, but Colombia is definitely on its way up as a popular backpacker destination — cheap, beautiful, and fun. Thank you Christina! 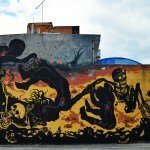 We were so impressed with the street art we found all over Colombia. Really incredible stuff! 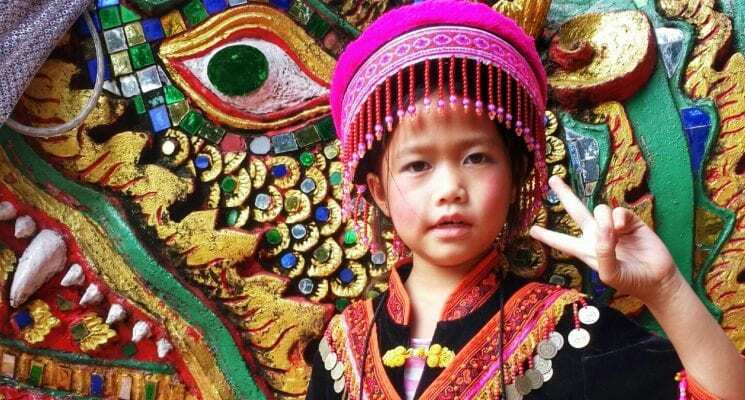 Wow, beautiful photos! 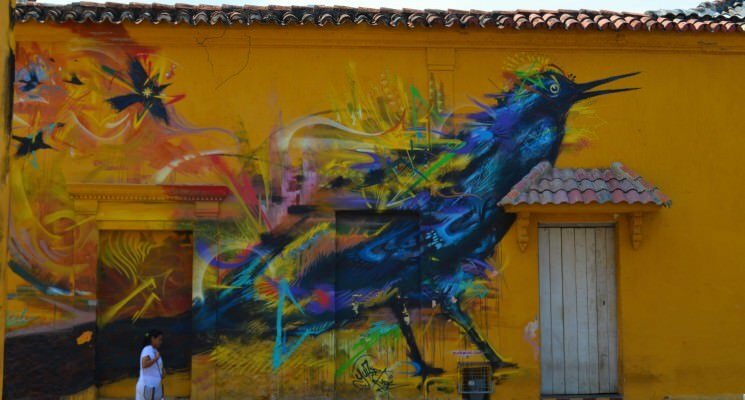 I love street art when it’s well done… It’s a great way to bring life to a place, and makes walls that would otherwise be grim (either concrete or covered in graffiti) look beautiful. Thanks Claus! We agree. 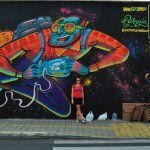 Discovering street art is one of our favorite things to do when we travel!